The major source of oil in the marine environment is spills resulting from crude oil transport. There are some 6000 oil tankers worldwide that transport crude oil, and these vessels are designed to ride low in the water when carrying a full load. After they unload their cargo they must take on seawater as ballast for their return trip to the oil fields. This ballast is pumped into holding ponds where the oil can be recovered. However, this ballast, along with the residual crude oil in their tanks, is pumped into the ocean before the next cargo of crude oil is loaded. It is estimated that 0.4% of the capacity of a tanker sticks to the tanker wall after the crude oil is discharged. If the tanker takes on ballast equivalent to one-third of its total capacity then about 1.6 x 104 gal of crude oil will be pumped out with the ballast of a tanker having a capacity of 12 x 106 gal. It is estimated that every year 137 million gallons of oil is introduced into the sea from "routine maintenance": ejection of tanker ballast and the many small spills resulting from crude oil transport (Figure 6-2). 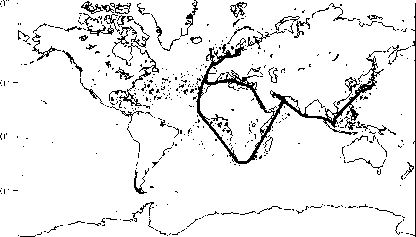 The sea lanes around the continent of Africa and the subcontinent of India are the most heavily oiled in the world as a result of the spills from the dense tanker traffic leaving the Persian Gulf (Figure 6-4). FIGURE 6-4 Positions at which visible oil slicks were observed between 1975 and 1978 by the Interglobal System Marine Pollution (Petroleum) Monitoring Project. 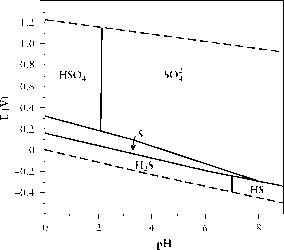 Redrawn from E. M. Levy, M. Ehrhardt, D. Koknke, E. Sobtchenko, T. Suzuoki, and A. Tokuhiro, Intergovernmental Oceanographic Commission, UNESCO, 7 Place de Fontenoy 75700, Paris, France 1981. Used by permission of the United Nations. Catastrophic oil spills can have dramatic local environmental effects, and because of this they are well documented in the national press and television. Major oil spills became a problem on the east coast of the United States in World War II when German submarines sank over 60 oil tankers, releasing 6.5 x 105 metric tons of oil over a period of three years. Since the tankers were traveling close to the shore in an attempt to avoid the submarines, much of this oil eventually washed up on the beaches.